WATKINS GLEN, N.Y., July 2, 2016 – Mark another one down in the win column for Shinya Michimi as he triumphed in Round 4 of the Lamborghini Blancpain Super Trofeo North America series championship July 2 at Watkins Glen International. Michimi earned a dominating, 28.124-second victory over the duo of Patrick Kujala and Brian Thienes to sweep the double-header event in the No. 1 Prestige Performance Lamborghini Huracán LP 620-2 representing Lamborghini Paramus. The victory was almost a carbon copy of his Round 3 win Friday. For the second race in row, Michimi started second, this time behind Luca Persiani in the No. 07 Dream Racing Motorsports entry representing Lamborghini Las Vegas. Michimi settled into second position laying down consistent laps behind Persiani, just like on Friday. And Michimi let the race run its course and come to him – just like on Friday. Persiani pitted late in the 10-minute mandatory pit window, trying to build a gap in clean air before handing off the No. 07 Huracán off to his co-driver, Larry DeGeorge. Persiani built a 96-second gap over the front of the field, but another flawless pit stop strategy call and perfect execution from Michimi were too much for Persiani to overcome. Michimi came out on top and built a three-second lead within one lap of the pit window closing. Michimi put on a clinic of precision and skill over the remaining 20 minutes, extending his gap each lap and ultimately coasting to his third win in four races this season. Kujala and Thienes ran a clean race to finish second in the No. 17 US RaceTronics entry representing Lamborghini Beverly Hills. It was the duo’s first podium finish of the season. They were also the first place Pro-Am division finishers. 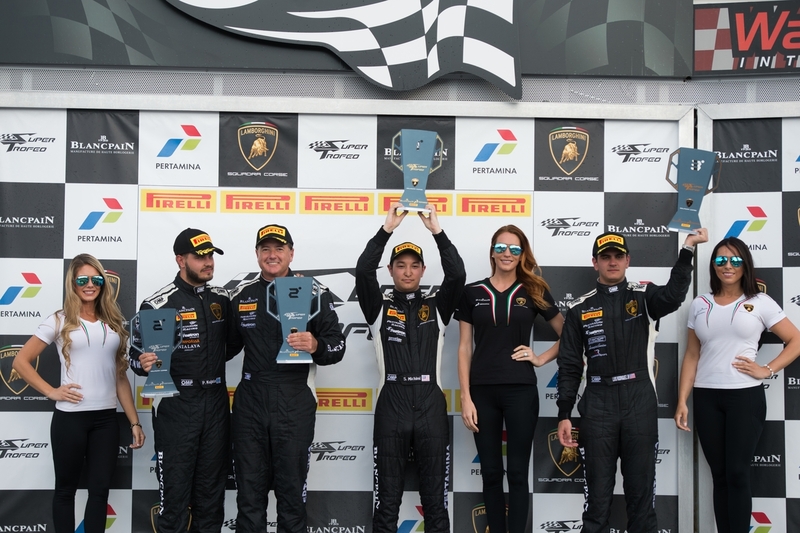 This was the first event in Super Trofeo North America for Kujala, the 2015 Super Trofeo Europe and World Final champion. He missed the opening weekend in May at Laguna Seca. Series rookie Luis Rodriguez Jr. finished third overall and first in the Amateur division in the No. 29 Change Racing Huracán representing Lamborghini Carolinas. It was his first overall podium and second class win. Brandon Gdovic made another strong drive today to finish sixth overall and second in the Pro-Am division after starting at the back of the grid in the No. 46 DAC Motorsports Lamborghini entry representing Lamborghini Palm Beach. He picked off the field one-by-one and finished only .123 of a second behind fifth place overall. Persiani and DeGeorge were able to hang on for a third-place Pro-Am finish, their first podium result of the season. DeGeorge was a Super Trofeo North America regular last season and drives a Dream Racing Motorsports Lamborghini Huracán GT3 in the GT Daytona class of the WeatherTech SportsCar Championship this year. This weekend was his first Super Trofeo start in 2016 and Persiani’s first dip into the series. In the Amateur division, James Burke and David Askew finished second and fourth overall in the No. 98 DXDT Racing Lamborghini Huracán entry. Damon Ockey rounded out the Amateur podium with a fifth-place overall finish, good enough for third in class in the No. 09 US RaceTronics Huracán representing Lamborghini Calgary. It was Ockey’s fourth consecutive podium finish in class. Ross Chouest earned the Lamborghini Cup division victory and finished ninth overall in the No. 3 DXDT Racing entry representing Lamborghini Miami. The win was Chouest’s fourth of the season. Will James was second in Lamborghini Cup in the No. 11 eXclaim Racing/Migliore Motorsports entry representing Lamborghini Paramus, and Shawn Lawless rounded out the podium with a third-place finish in the No. 27 Dream Racing Motorsports entry representing Lamborghini Las Vegas. The next Lamborghini Blancpain Super Trofeo America event will be Aug. 5-7 at Road America. It will be the series’ first visit to the famed track located in Elkhart Lake, Wisconsin. 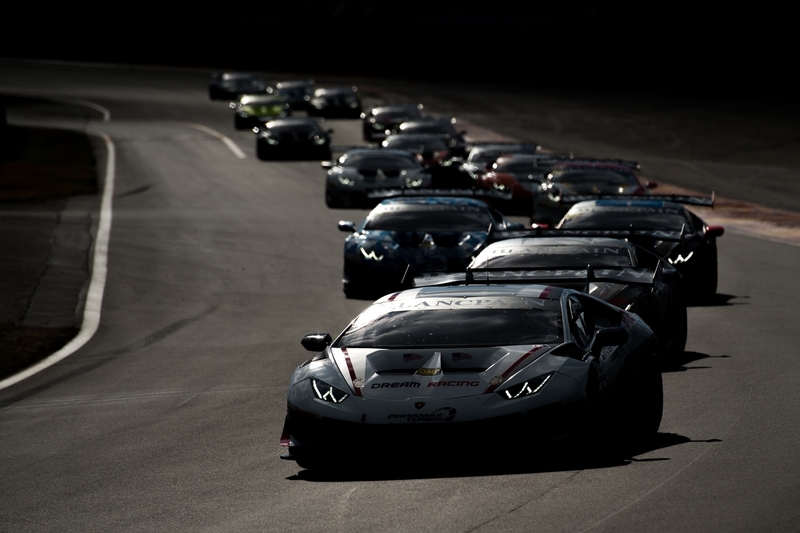 The event at Watkins Glen was part of the worldwide race action for the Lamborghini Blancpain Super Trofeo championship, which continues to reach new levels of success at every round in Europe, North America and Asia. The two races in North America followed races in Europe last weekend at Circuit Paul Ricard. The next race for the European series will be July 22-24 at Spa-Francorchamps, Belgium. Super Trofeo Asia will be back in action July 22-24 at Buriram in Thailand. Founded in 1963, Automobili Lamborghini is headquartered in Sant’Agata Bolognese, in Northeastern Italy. The Lamborghini Huracán LP 610-4, which made its world debut at the 2014 Geneva Motor Show, is the successor to the iconic Gallardo and redefines the luxury super sports car driving experience with its innovative technology and outstanding performance. The Aventador LP 700-4, in Coupé and Roadster offerings, represents the reference point in the world of V12-powered, luxury super sports cars. With 129 dealerships worldwide, in half a century Lamborghini has created an uninterrupted series of extraordinary, exclusive cars that include the 350 GT, Miura, Espada, Countach, Diablo, Murciélago, and several limited series like the Reventón, Sesto Elemento and Aventador J. The Veneno Coupé, the Egoista and the Veneno Roadster, were created to celebrate the brand’s 50th anniversary year in 2013.